Fountainhead School offers the Primary Years Programme from Nursery to Grade 6. The International Baccalaureate Primary Years Programme (PYP) is designed for students aged 3 to 12 and emphasizes on the development of the whole child through focus on the cultural, emotional, intellectual, physical, and social needs. At the heart of the PYP’s philosophy is a commitment to using guided, purposeful inquiry as the primary vehicle for learning. The programme actively engages students in their own learning and encourages them to develop a lifelong curiosity about the world. Students are encouraged to ask questions and reason things to develop a sound method for evaluating information and building knowledge. An aim of the PYP is to create a transdisciplinary curriculum that is engaging, relevant, challenging and significant for learners in the 3-12 age range. The written curriculum: What do we want to learn? 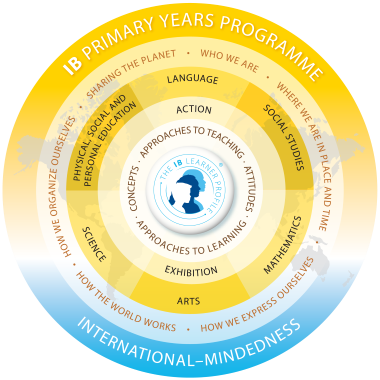 One of the most significant and distinctive features of the IB Primary Years Programme is the six transdisciplinarythemes. These themes provide IB World Schools with the opportunity to incorporate local and global issues into the curriculum and effectively allow students to ‘step up’Â beyond the confines of learning within subject areas. Who we are – an inquiry into the nature of the self; beliefs and values; personal, physical, mental, social and spiritual health; human relationships including families, friends, communities, and cultures; rights and responsibilities; what it means to be human. Where we are in place and time – an inquiry into orientation in place and time; personal histories; homes and journeys; the discoveries, explorations and migrations of humankind; the relationship between and the interconnectedness of individuals and civilizations, from local and global perspectives. How we express ourselves – an inquiry into the ways in which we discover and express ideas, feelings, nature, culture, beliefs and values; the ways in which we reflect on, extend and enjoy our creativity; our appreciation of the aesthetic. How the world works – an inquiry into the natural world and its laws, the interaction between the natural world (physical and biological) and human societies; how humans use their understanding of scientific principles; the impact of scientific and technological advances on society and on the environment. How we organize ourselves – an inquiry into the interconnectedness of human-made systems and communities; the structure and function of organizations; societal decision-making; economic activities and their impact on humankind and the environment. Sharing the planet – an inquiry into rights and responsibilities in the struggle to share finite resources with other people and other living things; communities and the relationship within and between them; access to equal opportunities; peace and conflict resolution. Students inquire into, and learn about, these globally significant issues in the context of units of inquiry, each of which addresses a central idea relevant to a particular transdisciplinary theme. Lines of inquiry are identified in order to explore the scope of the central idea for each unit. These inquiries are substantial, in-depth and usually last for several weeks. Since these ideas relate to the world beyond the school, students see their relevance and connect with it in an engaging and challenging way. Students who learn in this way begin to reflect on their roles and responsibilities as learners and become actively involved with their education. All students will come to realise that a unit of inquiry involves them in an in-depth exploration of an important idea, and that the teacher will collect evidence of how well they understand that idea. They will expect to be able to work in a variety of ways, on their own and in groups, to allow them to learn to their best advantage. The PYP offers a balance between learning about and through subject areas, and learning beyond them. There are six subject areas in the PYP-arts; language; mathematics; physical, social and personal education; science; and, social studies. These subject areas provide students with knowledge, skills, and concepts which students can explore to understand the interconnected nature of the subject areas and the transdisciplinary themes. The taught curriculum: How best will we learn? The PYP curriculum is defined broadly to include an approach to teaching and learning, in recognition of the fact that, in practice, the two are inextricably linked. The taught curriculum is the written curriculum in action. 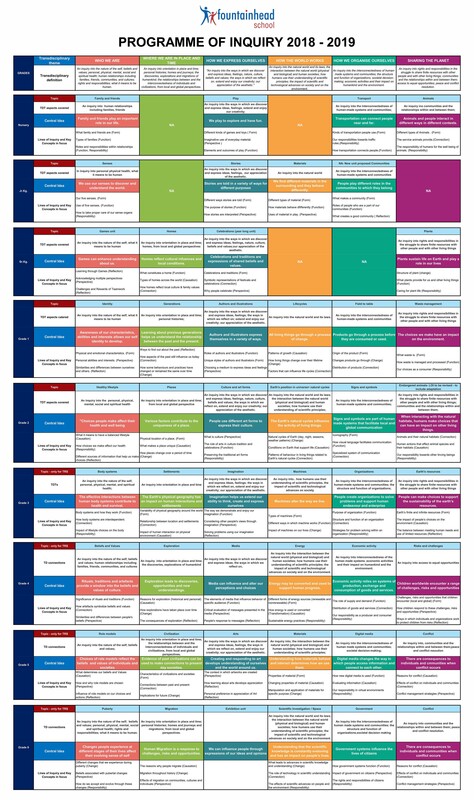 In the PYP, the taught curriculum is part of what the continuum of IB programmes calls the approaches to teaching (ATT). The taught curriculum reinforces the pedagogy of authentic learning that is inquiry-based and conceptually driven. The programme is committed to structured, purposeful inquiry that engages students actively in their own learning. In the PYP it is believed that this is the way in which students learn best. In this way, teachers can support them in constructing meaning. The taught curriculum also touches on the approaches to learning (ATL) which are currently identified as “transdisciplinary skills”Â in the PYP. The ultimate intention of ATL across the IB continuum is to develop self-regulated (self-managed, self directed, independent) learners through skill based, process focused teaching. The deliberate use of ATT strategies and ATL reinforces a holistic experience that not only addresses students’ cognitive development, but their social, emotional and physical well being. The assessed curriculum: How will we know what we have learned? Assessment in the Primary Years Programme identifies what students know, understand, can do and value at different stages in the teaching and learning process. The direct link between assessment and the teaching and learning process means that they must function purposefully together. Assessing the result of inquiry as well as the process of inquiry are important objectives of the programme. monitor the effectiveness of the programme. Essentially, there are two types of assessment in the PYP, each of which has a specific function. Formative assessment is embedded in the teaching and learning process and therefore occurs in the daily routine of a classroom. It aims to support students to become better learners and helps teachers to plan the next stage of learning. Summative assessment occurs at the end of the teaching and learning process and provides students with opportunities to demonstrate what they have learned in a new context. It aims to give teachers, students and parents clear, evidence-based insight into students’ understanding at a particular moment in time. All assessment in the Primary Years Programme is carried out internally by teachers within the school. The IB does not set examinations nor does it moderate grades in the PYP. the students demonstrate both independence and an ability to work collaboratively. Consideration of these points allows teachers to plan for effective teaching and learning opportunities that give students a chance to develop their inquiries further. The short video below helps to bring the learner profile alive. Students who are in their final year of the programme are expected to carry out an extended, collaborative inquiry project, known as the exhibition, under the guidance of their teachers. The exhibition represents a significant event in the life of both the school and student, synthesizing the essential elements of the programme and sharing them with the whole school community. It is an opportunity for students to exhibit the attributes of the Learner profile that have been developing throughout their engagement with the programme. It is a culminating experience marking the transition from PYP to further steps in education. Schools are given considerable flexibility in their choice of real-life issues or problems to be explored or investigated in the exhibition.